I'm currently reading Catcher In The Rye and there was a quote exactly like this when Holden goes to the Museum of National History in Chapter 16. The whole book (or at least as far as I've read) has been about Holden's struggle to grow up and lose his innocence. His younger brother, Allie, died before he ever got the chance to lose his innocence and Holden keeps reminiscing on his memories with Allie. When Holden describes the Museum of National History he says, "The best thing, though, in that museum was that everything always stayed right where it was. Nobody'd be different. The only thing that would be different would be you." It's been a rough year for me. That's actually an extreme understatement. It seems that everything has been one thing after another with my friend group and my family. Sometimes, it's hard to see the positive things and it's so easy to reminisce on the days when everything was ok; you kind of wish everything was the way it used to be... but for some reason you realize it just could never happen. Why? 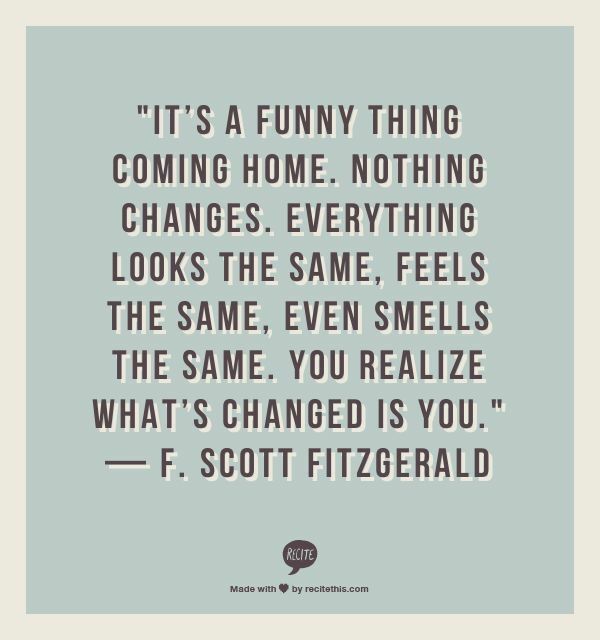 Because you've changed; you're different. Sometimes it's hard to realize that you have to give up on the past and just work through the present one step at a time... But eventually it will all be worth it. It's hard to move on and accept that you've changed, but it is doable!